For Chris Wallace, music is “Crazy” … and good – Live! Starring ... You! 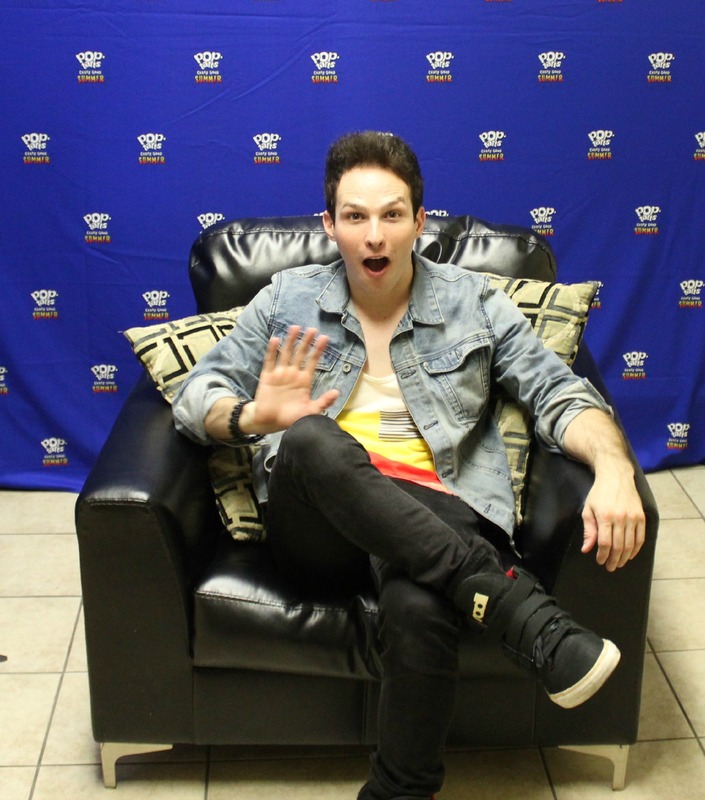 Chris Wallace opened for Demi Lovato at the Pop-Tarts Crazy Good Summer concert in Philadelphia. Living in the small town of Hebron, Indiana, Chris Wallace had big dreams that seemed impossible to accomplish. Seemed. But he accomplished them. What do you do to get your fans excited for a show? Chris: I made this intro on my computer to pump up my first song to pump everyone up. When I go out there, I just run out and go crazy. Every time I step on stage I get so excited because I know that’s what I was born to do. You used to be a part of the band The White Tie Affair. What made you want to go from being in a band to solo artist? Chris: The other guys were really just moving on to the next steps of their lives by having kids and getting married, so they were kind of done with it. But I felt like I was just getting started, so I kept going. Are there any big differences as a solo artist? Chris: Well, it’s easier and quicker to make decisions now. You don’t have to worry about compromise. I read a story about you and Lady Gaga: You were both backstage watching Axl Rose (from Guns N’ Roses) perform, and while you were watching, she gave you some advice. She said, “You have to be bigger than your songs.” How did that affect you musically? Chris: A lot of people make really great songs and you never hear about them after that. She had number-one songs, and people’s grandparents know who Lady Gaga is. Doing things like that, and being who she really is, made her bigger than her songs. Chris Wallace told LSY’s Philadelphia reporter, Graceanne Rumer, that most people don’t realize he travels more than anything – including playing music. Chris: Growing up, my parents listened to a lot of Queen and Prince, but mostly I would say everything from the ‘90s. My older sister was always listening to it, and I really grew to like it. Do you ever try to incorporate any messages to your fans through your music? Chris: Yeah, totally. There’s a song on my album called “Invincible”, and I actually wrote it to myself but people send me messages about and tell me it inspired them. All my songs are based off of personal experiences, so I’m sure a lot of people can relate to them. Chris: When I write songs I try to make them personal by writing about real things. I feel like it’s important to connect with your music, make it you and not being afraid to be vulnerable by talking about something that actually happened. My new single is called “Keep Me Crazy”, and it’s about this girl I was in a relationship with where we fought all the time. I remember fighting with her one day and just going crazy and thinking, “I’m going to write a song about this.” I try my best to keep my songs honest and actually write about real things. You grew up in a small town. How do you think it affected your dreams? Did it make it harder? Chris: It definitely made it harder because I was just really a dreamer and I didn’t have a lot of ways to go after it. In my town, everyone really listened to heavy metal music, and I wanted to get on stage and sing music, so that was the genre I did. It hindered things a little bit, but I think it made me work harder. It made me stand out a lot too. Chris: It’s just one of those things where you have to be crazy. Like, I wanna do that! And point at the stars and say, “I’m going to fly there!” It’s just as ridiculous as a thought, you know? You really have to make it happen for yourself. Do you have any advice for kids who are growing up in small towns with big dreams like you? Chris: If you want to do it, you can do it. You just have to want it more than anything else. It’s a lot of sacrifice. Everyone wants to be a rock star, but can you really spend a year on tour without seeing your family and spend Thanksgiving dinner in a diner? There are things you’re going to miss out on and you have to really sacrifice life in general. Keep pushing if you really want it. What are some things people don’t know about being famous? Chris: Most people don’t know that I travel more than anything – more than singing, and more than playing music. I feel like people forget that. You’re in a place like London one day and you need to adjust to the time zones and get prepared and do the show, then the next day you have to go back to the States. It’s really a lot of work. It’s more work than I even thought it would be and most people don’t realize that either. You don’t really get a lot of free time where you’re in a place. Today I’m in Philly, I don’t really get to hang out and see everything here. I see the venue, the hotel and the airport. People really don’t understand that about tours. Today’s show is sponsored by Pop-Tarts, so I have to ask: What’s your favorite Pop-Tart? Chris: I just tried the new chocolate peanut butter kind, and that was really good. My all-time favorite though, is cherry. I was a s’mores kid but now I’m a cherry guy. « Ozzie Smith offers wizard-ly advice for thinking like the greats!